Part of the reason why a few of my players and I have been doing one-offs and casual D&D games is to discover balance issues in the game, places where the rules are very up in the air, or situations that don’t actually have concrete rules. Once we spot instances like these we’ll go about implementing “fixes” in the next one-shot we do before the campaign to see if we like the fixes. It’s a group effort for the most part even though I do the initial balancing. This post is going to reflect a fairly specific situation involving a lightfoot halfling rogue lvl 2+ that is making a ranged attack. The rogue wants to make a sneak attack on the target. 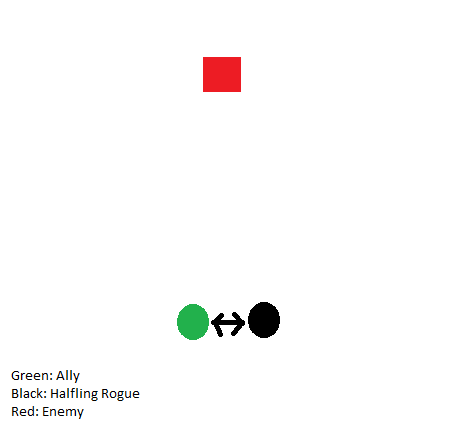 However, the target does not have any enemies within 5ft of it and the rogue does not have advantage on its attack. A lightfoot halfling rogue can hide behind a creature that is at least one size larger than them. If they have a medium or taller creature within their movement they could use their cunning action to hide. If they successfully hide behind this creature they can then make a shot at advantage on the target. Thereby giving them both sneak attack and advantage. Honestly, I was floored by the tactics that the players came up with. The rogue was able to hide behind another ranged character and pull off this move quite a few times. It was extremely creative and I want to foster that in my games. Though it does feel a bit broken from a mechanics standpoint. The player agreed so the two of us came up with this ruling to make it both fair and fun. Cunning Action: “You can take a bonus action on each of your turns in combat. This action can be used only to take the Dash, Disengage, or Hide action” (PHB pg 96). So the idea here is that the lvl 2 Lightfoot Halfling Rogue wants to use Sneak Attack for their ranged weapon attack on the enemy. Unfortunately, they do not have advantage on the attack or an enemy of the target within 5 ft. of the target. Fortunately for them though is that they have an ally within their movement distance that they can hide behind. The rogue’s turn will be the following. First, the rogue can move to the ally. Then it will make a stealth check to hide using their Cunning Action. Finally, if the stealth check was successful it can use the rest of their move to step out and shoot the enemy with advantage. Since they have advantage they can add the Sneak Attack damage. The main problem I have with this situation is that the lightfoot halfling rogue is doing this same maneuver to the same creature multiple times. The rogue is simply stepping out in plain sight to shoot and then hide behind the ally right next to them. This seems rather unrealistic. Not to say that fighting monsters and using magic is real. This just doesn’t feel reasonable for something with at least average intelligence to fall for multiple times in a row. My take on it is that the first time the character does this they are able to without any issue so long as their hide (Stealth Check) action is a success they will gain advantage and be able to use the sneak attack. Each subsequent time they hide from the same creature behind the same person they will be at disadvantage for their hide action. On the other hand, if the player is playing against something very stupid (7 INT or lower) and are not very perceptive then I would not force them to be at disadvantage against the monster. If something could be legitimately fooled by a game of “peek-a-boo” I’ll let that happen. For example, a flesh golem boasts an average Perception and a 6 or lower INT. The Rogue would not roll at disadvantage. A hippogriff has only 2 INT, but has a bonus perception skill and boasts a large 15 passive Perception. The maneuver would be done at disadvantage after the first time it is used against the hippogriff. Basically, this was just a cool move that one of my players thought up and used. The player and I then came up with a way to balance the move out as it was too powerful. I’m satisfied with this ruling because it is able to be applied to any situation. It also allows a fair shot at hiding in a situation where other Rogues would be unable to. All in all, this was a great exercise for teaching my players how to homebrew.